A medication commonly prescribed for agitation and other behavioral problems in people with Alzheimer’s disease could actually make their condition worse, a new study reports. The study, however, was small, and much more needs to be learned about treating agitation and other “problem” behaviors in the millions of people afflicted with Alzheimer’s disease. The drug, sold under the brand name Seroquel and known by doctors as quetiapine, has been approved to treat people with the psychiatric conditions schizophrenia and manic-depression (bipolar disorder). Doctors commonly also prescribe the drug to people with Alzheimer’s disease who are agitated and disruptive. Problem behaviors occur in well over half of people with Alzheimer’s and become more common as the disease progresses. They are a major source of stress for people with Alzheimer’s as well as caregivers and nursing home staff who care for those with the memory-robbing illness. Reporting in the British Medical Journal, researchers at the Institute of Psychiatry in London found that Seroquel could actually accelerate the rate of cognitive decline in those with Alzheimer’s. The scientists looked at 93 men and women who had Alzheimer’s and high levels of agitation and distress who were being cared for in nursing homes in England. They were divided into three groups. One group received a daily dose of Seroquel to combat behavioral complaints. Another group received rivastigmine, or Exelon, a drug used to treat the cognitive decline of Alzheimer’s, while the third group got a dummy pill (placebo). The patients were tested for memory and cognitive skills as well as agitation levels to assess whether their disease had grown worse. After six months, the group receiving Seroquel did not show significant improvements in agitation scores compared to the other groups. As a group, they also had lower scores on memory and cognition compared to the group taking a placebo. Spokespeople for AstraZeneca, the company that makes the drug, counter that Seroquel has been used safely and effectively to treat psychiatric conditions for years. They also point out that the current study was very small: More than half the patients actually dropped out of the study by the time it was completed. Problem behaviors in just a few patients, they say, skewed the final results, so that valid conclusions could not be drawn. Experts agree that more research is needed into safe and effective treatments for common behavioral problems related to Alzheimer’s. Dr. Barry Reisberg, Director of the Fisher Alzheimer’s Disease Program at New York University School of Medicine and Professor in the Department of Psychiatry, says that like many of the drugs used to treat behavioral problems, Seroquel has not been tested extensively specifically in those with Alzheimer’s disease. He also notes that the drug has a sedative effect, which can interfere with cognition and mental functions, including memory, as long as the person is feeling its sedating effects. Doctors commonly prescribe a wide variety of psychiatric drugs, including sedatives and psychosis-fighting medications, to help manage difficult behaviors in those with Alzheimer’s. Unfortunately, many of these medications have serious side effects and only limited effectiveness. More systematic research is needed into studying such drugs and finding ones that offer clear benefit. The Fisher Center for Alzheimer’s Research Foundation continues to be a leader in the search for a cure. 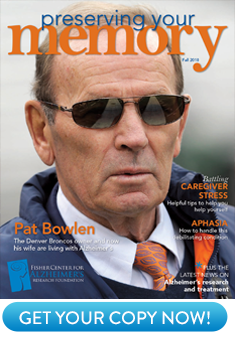 Keep up with the latest research findings and learn more about the disease at their Web site, www.ALZinfo.org. Clive Ballard, Marisa Margallo-Lana, Edmund Juszczak, et al: “Quetiapine and rivastigmine and cognitive decline in Alzheimer’s disease: randomised double blind placebo controlled trial.” BMJ Online, Feb 2005; 10.1136/bmj.38369.459988.8F.